Ok, so I got to thinking (which most of the time is a really dangerous thing for me to do)...am I supposed to post the weekly picture the actual day that the new week begins? Or do I post it on the last? Well, regardless of when it's supposed to be posted, I am posting mine on the last day of the week. 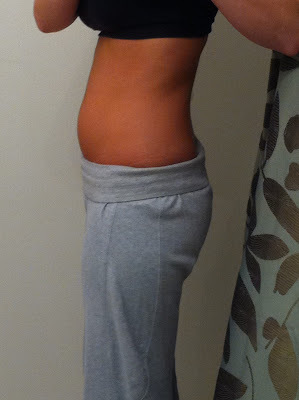 So today I am posting this 12 week picture, but today just so happens to be the first day of my 13th week...?! Do you smell what I'm steppin' in or are you still confused? Oh well..moving on. I only have approximately 4 minutes to write this because Grey's Anatomy comes on and when it starts the world around me stops. And yes. I officially look pregnant. Thanks for noticing. How Far Along: 12 weeks..well technically I'm 13 weeks but for the sake of this post it all has to do with week 12. I digress. Total Weight Gained: None! This is probably due to the fact that I had the flu for a mother freakin' eternity 4 days and could barely eat, and when I did eat it came right back up. Maternity Clothes: None yet, just thankful for leggings! Sleep: It would be great if Toasty wouldn't hog the bed. More specifically, my pillow. I think it's almost time we get a king size bed. Best Moment of the Week: Not dying from the flu. Being pregnant isn't fun, much less pregnant + flu. I mean, I couldn't even shower, I was a hot mess. Food Cravings: Cap" N Crunch cereal. It takes me back to when we lived in the Dominican Republic though. I've eaten so much that the roof of my mouth is peeling. Hopefully this is just a phase! Oh and corn dogs from Dairy Queen. And Fudgesicles. But not the Fat Free ones like Adam got me, they melt too fast. Moving on. Food Aversions: Pasta with gooey sauce. Belly button/stretch marks: Nope. Although I have a scar on my stomach that I am really worried is going to eventually stretch out and look like one big stretch mark. I will let you know when that happens. Symptoms: Short of breath, especially while doing massage at work. I know my clients thing I am a weirdo for huffing and puffing for an entire hour but I can't help it! Gender: Not sure yet, we find out in 5 weeks! What I miss: Everything. I am leaving it at that because what I want to say is not blog appropriate. What I’m looking forward to: Finding out what this little thing is! I can't wait to start shopping! Milestones: I'm tired of thinking so I am skipping this part and ending this post. Goodnight. I went to the doctor last Wednesday so I will post about that later, although nothing interesting happened because we spent approximately 2 hours in the waiting room and 3.5 minutes talking to the doctor. So actually, I probably won't be posting about that. haha aww Lindsay I think you're labor is going to easier because your pregnancy so far has been so stinky... that's fair right?